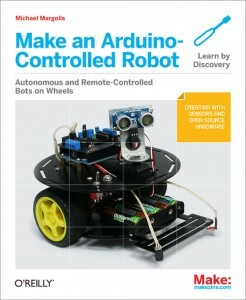 O’Reilly is offering a free webcast on Making Arduino Controlled Robots. The one hour presentation is scheduled for Tuesday, October 30, 2012 (yes, that’s today — short notice) at 10 AM PT and features Michael Margolis, author of the Making an Arduino-Controlled Robot. The presentation focuses on sensors and motor controllers in Arduino projects with emphasis on their relation to robotic applications. This entry was posted on Tuesday, October 30th, 2012 at 12:01 am	and is filed under Arduino, talks. You can follow any responses to this entry through the RSS 2.0 feed. You can skip to the end and leave a response. Pinging is currently not allowed.